The Ruffwear Climate Changer Fleece Jacket can offer your dog warmth on cold days. The jacket is made from fast-drying polyester fleece. 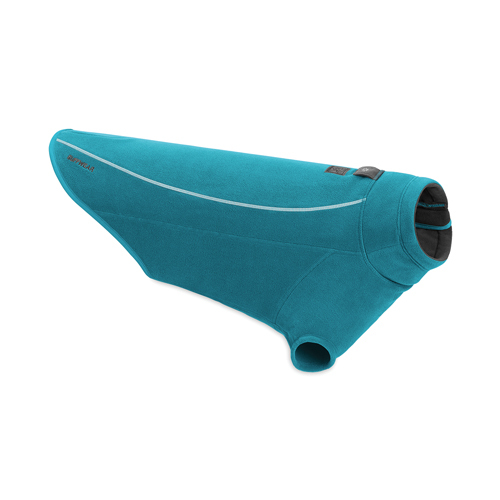 The sleeves make sure that no heat is lost, while your dog's range of motion is not inhibited. The Climate Changer can be worn under other Ruffwear jackets. Your dog can sometimes use some extra warmth on cold days. The Ruffwear Climate Changer is the perfect solution for these days. This fleece jacket is made from recycled polyester fleece and dries quickly. The sleeves make sure that your dog's body heat remains between his coat and the jacket. For extra warmth, the Climate Changer can be worn under the other Ruffwear jackets. The Climate Changer can also be worn in combination with the Ruffwear Powder Hound. You can easily put the coat on and off using the zipper. The reflecting trims ensure good visibility at dusk and night. The Climate Changer can be washed in cold water. What size does my dog need? What if the Ruffwear Climate Changer Fleece Jacket doesn't fit? The Ruffwear Climate Changer Fleece Jacket can be removed from the packaging and held up next to the dog in order to check whether the jacket fits. For hygiene reasons, the jacket cannot be returned if it has come into contact with the dog. If we find that the returned jacket is stained, worn, contains animal hair, smells or has been washed after use, we cannot return the product to you. In this event, it will be donated to a charity (local shelter). As we are often confronted with jackets that are returned in a less than new condition, we have to apply these rules for fitting and/or returning products. Have you used Ruffwear Climate Changer Fleece Jacket before? Let us know what you think about this product.